The report "Greenhouse Irrigation System Market by Type (Drip Irrigation, Micro Sprinkler Irrigation, and Boom Irrigation), by Application (Vegetables, Flowers & Ornamentals, Fruit Plants, and Nursery Crops), & by Region - Global Forecast to 2020", The global greenhouse irrigation system market is segmented on basis of type, application, and geography. Drip irrigation system, micro sprinkler irrigation system, and boom irrigation system are the segments based on different techniques. Drip irrigation system has the largest share in the type segment in 2014 and it is expected to grow at a CAGR of 10.7% from 2015 to 2020. Irrigation is the application of water on, above, or below the soil by different techniques, such as surface drip and subsurface irrigation. Greenhouse irrigation can be defined as a method of irrigating greenhouse crops by supplying water to the soil surface through drip tubes or tapes, emitters, and sprinklers. This system is used when there is scarcity of labor, or where precise and frequent irrigation is needed without wastage of time and water. On the basis of different applications, the market is segmented into vegetables, flowers & ornamentals, nursery crops, and fruits plants. Vegetables are the largest application segment of the greenhouse irrigation system market and is projected to grow at a CAGR of 10.5%. The geographical analysis includes all the major regions for greenhouse irrigation systems, namely, North America, Europe, Asia-Pacific, and rest of the world (RoW). Presently, countries such as China and Spain dominate the global consumption of greenhouse irrigation systems. China is the largest manufacturer and supplier of greenhouse irrigation systems. China, Mexico, and Turkey are the fastest-growing markets owing to growth in land area under greenhouses in these countries. 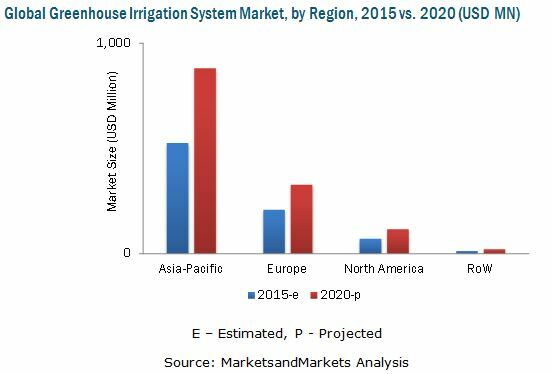 The global greenhouse irrigation system market is projected to reach USD 1.3 Billion by 2020. In 2014, Asia-Pacific held the largest market shares and is estimated to grow at a CAGR of 10.5% during the forecast period. It was also the most active region, in terms of strategic developments, and accounted for a share of 32% of the total development activities in the greenhouse irrigation system market between 2011 and 2015. This report includes key market drivers and inhibitors, along with their impacts in detail. It also includes marketing and development strategies, along with product portfolio of the leading companies, such as Netafim Ltd. (Israel), Rivulis Irrigation (Israel), Lindsay Corporation (U.S.), The Toro Company (U.S.), Jain Irrigation Systems Ltd. (India), EPC Industries Limited (India), Rain Bird Corporation (U.S.), Valmont Industries, Inc. (U.S.), Nelson Irrigation Corporation (U.S.), and Irritec S.p.A. (Italy). To gain more shares in the market, key players depend on their geographically diverse businesses, capability to invest in R&D activities for better technology, large distribution networks, and cross-selling marketing strategies. The strategy of new product/technology launch, adopted by several players, accounted for a share of 38% of the total strategic developments in the green house irrigation system market.